**As seen on the Today Show! 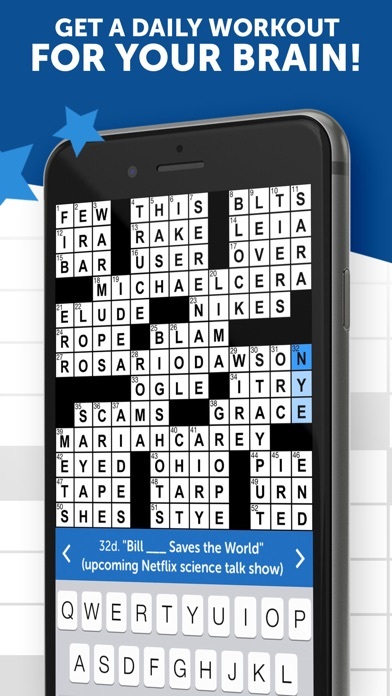 ** From the team that brought you Words With Friends comes Crosswords With Friends - the first daily crossword puzzle that’s written for today’s world! Test your brain power with a new puzzle every day that’s relevant to entertainment, pop culture, and sports news happening NOW! 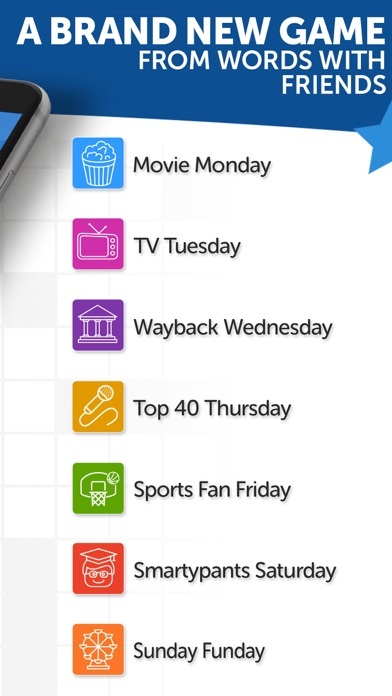 Enjoy fresh puzzles daily with a new themes every day of the week - Movie Monday, TV Tuesday, Wayback Wednesday, Top 40 Thursday, Sports Fan Friday, Smartypants Saturday, and Sunday Funday! Crosswords With Friends presents the world’s BEST crosswords for you 365 days a year. Led by co-editors Trip Payne (co-star of the crossword documentary Wordplay) and Amy Reynaldo (author of How to Conquer the New York Times Crossword), our daily crosswords are created by some of the world’s most published crossword writers. Get ready for a top-notch crossword experience! Game Features - English Only Game CROSSWORDS WRITTEN BY INDUSTRY EXPERTS Exercise your brain and expand your vocabulary by solving crossword puzzles created by crossword champions and writers from top newspapers! FUN PUZZLE THEMES 7-DAYS A WEEK Play a new crossword every day, and enjoy unique, fun themes! Access thousands of additional puzzles in the calendar archives! 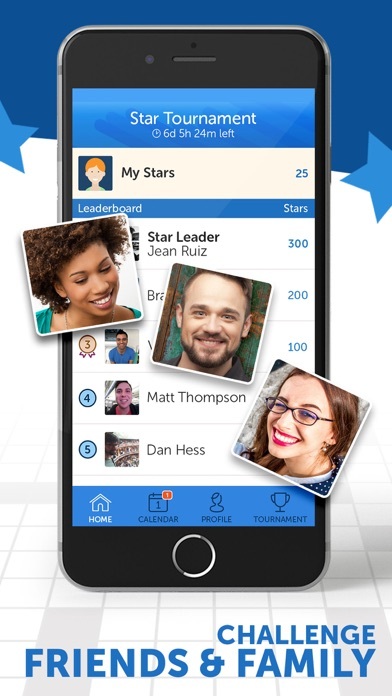 CLIMB THE LEADERBOARD Challenge your friends and check the leaderboard to see who solved the daily puzzle the fastest! COMPLETE WEEKLY CHALLENGES Test yourself with new goals each week to earn great rewards and collect badges as you go! COLLECT PUZZLE PACKS Movie buffs, sports fanatics and nerds of all kinds, rejoice! Add a pack of 5 themed puzzles to your collection. Solve them all to collect badges and become the ultimate crossword master. HELPFUL HINTS WHEN YOU NEED THEM Stuck on a word? Use hints to move ahead faster. Playing Crosswords With Friends challenges your brain, improves your pop culture knowledge, and lets you compete with friends. 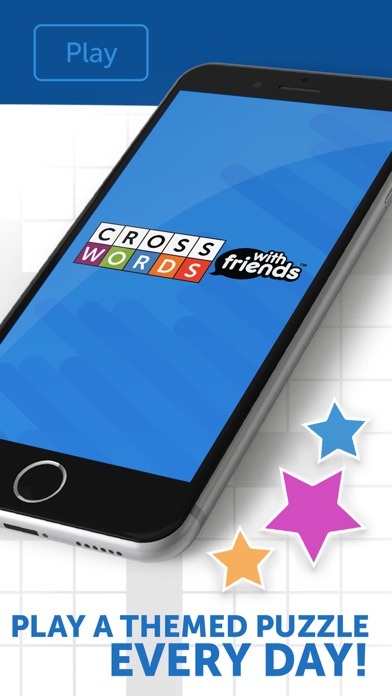 Download and play the all new Crosswords With Friends! Additional information: The game is free to play; however, in-app purchases are available for additional content and in-game currency. Use of this application is governed by the Zynga Terms of Service (http://m.zynga.com/legal/terms-of-service). Love the game. Good for the brain. This puzzle game is fun and also challenging. Play against friends or just yourself to see if you can better your solving times. 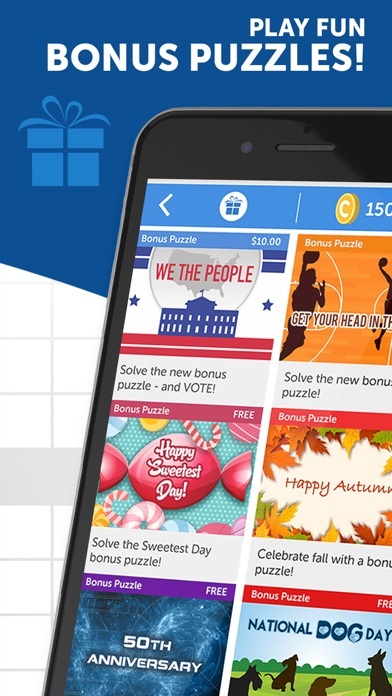 Earn coins and hints to help solve answers you do not know. A different puzzle in a different category each day. Join up today to begin your fun !!! Challenging and very entertaining, never miss a daily puzzle!! Great to play clues are different and timely using current events and people in the news. Doable puzzles with rewards that keep you coming back. I look forward to doing this puzzle everyday. Starts my day off with a success.